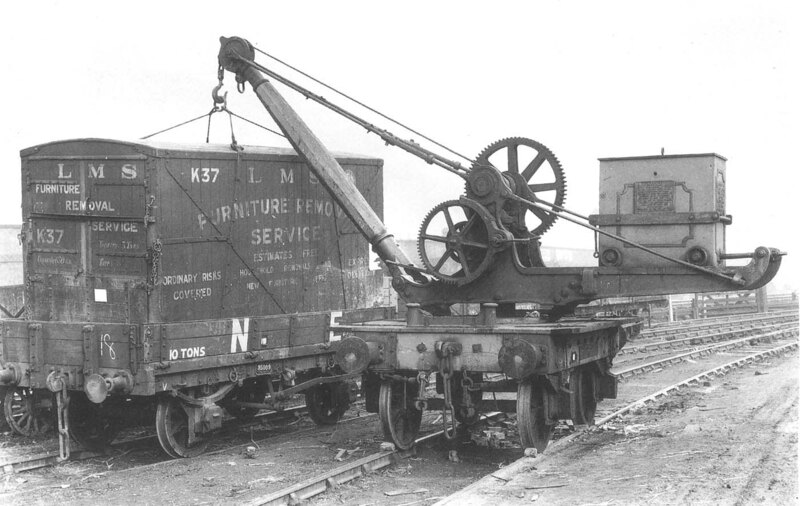 An LMS Container being off-loaded by a travelling crane in Banbury Street goods yard on 3rd February 1932. The use of container traffic in the 1920s and 1930s was yet another response by the railways to market opportunities being created by changes to social mobility in the country. As people began to be more mobile due to employment opportunities, they needed to move their homes too. The LMS service being advertised and seen in operation above made great virtue of the fact that house items only needed packing once and gave reassurance that items would not be damaged or lost in transfer between road and rail vehicles. The wagon mounted hand operated crane has been positioned along side the container and a road vehicle would be drawn up alongside ready for the crane to rotate 180° in ordder to place it on the road vehicle. The large box on small wheel cantilevered outwards would be moved by a screw horizontally to a position to balance the load. The chocks being used to ensure the crane would not roll away on its own accord are bricks and would certainly not be a practice acceptable today.